After a 2 1/2 hour drive Thursday morning, we arrived at Lovewell State Park near Webber, KS. 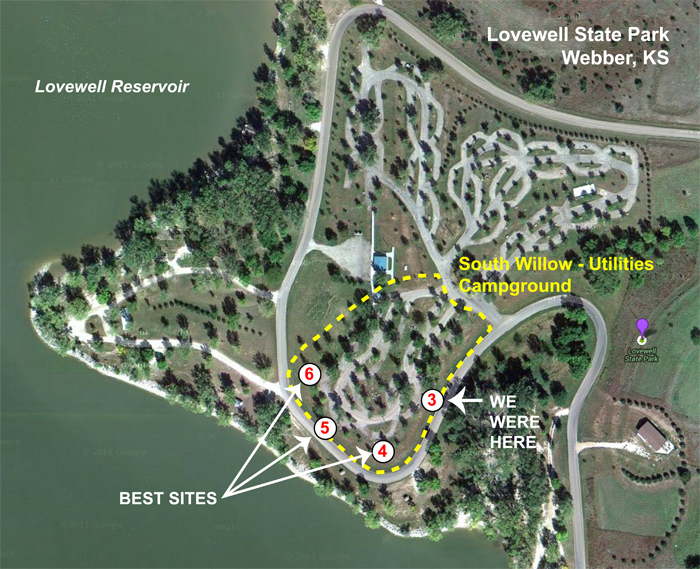 The campground (actually “campgrounds”) is located on the north side of the Lovewell Reservoir and we stayed at Site #3 on the South Willow Utilities campground. This campground had full hookups (50A electric, water, and sewer) which is not typical of a state park. Besides a few Great Blue Herons, there was a pod (gaggle? herd?) of Pelicans on the lake. At first we thought they were swans, but their distinctive long bill gave them away. Also spotted a few deer when I walked the dogs Saturday morning. We did some walking near the reservoir and Jan painted a picture. Wow… white Pelicans at that. Very nice. They migrating… just like you guys. Jan’s painting is very nice. Water colors? Acrylics! I had to leave my oils in favor of a paint that did not have a strong odor and dries quickly. I am trying to learn to do landscapes. The pelicans were such a surprise. Beautiful birds.